Ayurdaya or Longevity : In Astrology the prediction of longevity of an individual is a very difficult and tough problem and a complicated one. However great the astrologer may be, still the result of prediction is never 100% accurate. It becomes approximate only. While predicting or analyzing a chart it is best suggested that first of all the longevity of the native must be noticed since our ancient sages aptly sum up the theory in the following sloka : purna mayuhu parikshaiv paschallakshna muchate, ayurvina naranamtu lakshanaiah kim prayojanam “. It means if there is no longevity in the native's chart, there is no use of having other yogas. In such circumstances hats off to the greatest astrologer Varahamihara, who could predict the death of the son of his king. This is the greatest proof of the greatness of our ancient Vedic Astrology. Longevity (Human life span) can be classified under four important types : 1. Balarishta (Infant mortality) : It means the death before 8 years. 2. Alpayu (Short life) : It means the death between 8 to 32 years. 3. Madhyayu ( Middle life) : The span of life between 33 to 75 years. 4. Purnayu ( Full life ) It is from 75 to 120 years. Some authors are of the opinion that Madhyayu extends from 32 to 70 years. Purnayu extends from 70 to 100 years. In accordance of Vimshottari dasa Purnayu extends upto limit of 120 years i.e., Deerghayu. Balarista (Infant Mortality) Balarishta is one of the four divisions of Span of human life. It is otherwise known as infant mortality. The child dies before the age of 8 years due to peculiar combinations of planets in different bhavas. Some factors are mentioned below : “Chandrastamancha dharanisuta saptamancha Rahur navamancha Sani janma Guru struteeye, Arkastu pancha Brughu shatka Budha Chaturdhe Ketur vyayetu janitor maranaya sadyaha." i.e., Moon in 8th, Mars in 7th, Rahu in 9th, Saturn in lagna, Guru in 3rd, Sun in 5th, Venus in 6th, Budha in 4th, & Ketu in 12th house cause Balarishta to the native. Following combinations may also be considered : 1. Weak Moon in the ascendant or in the 8th house. 2. Malefics in quadrants. 3. Malefics in the last navamsa of the rasi. 4. Malefics in 2nd,6th,8th, and 12th houses. 5. Lord of dasa at birth in conjunction with evil planets. 6. Rahu in 7th house aspected by Sun and Moon. 7. Saturn + Mars in lagna or 8th house or 7th house. 8. Balarista stars and padas: Aswani 2,4. Bharani 2, Krithika 3, Rohini 1,2, & 4, Mrigasira 1, .Pushyami 1, Makha 2, Uttara 2, Hasta 3,& 4, Chitra 2, Visakha 4, Anuradha 3, Jyesta 3, Moola 2,3; Uttarashada 1, Dhanishta 2, Satabhisha 1, and Uttara-bhadra 4th pada. Lagna, lagna lord, 8th house, lord of 8th house, Moon when hemmed between malefic planets which is known as papa karthari yoga cause balarishta which is a standard astrological dictum. Counter Action of Balarishta: 1. Jupiter powerfully posited in ascendant. 2. Lord of lagna when powerful. 3. Moon occupying Dreshkhana of Mercury, Jupiter and Venus. 4. Full Moon between two benefics. 5. 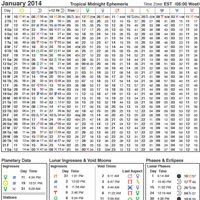 Full Moon aspects lagna with Jupiter in a quadrant. 6. Malefics in the beneficial shadvarg. 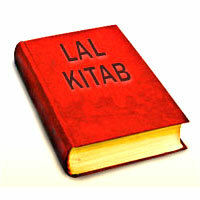 All the above combinations remove or nullify the so called Balarishta. Alpayu Alpayu indicates life between 8 to 32 years of age due to peculiar combinations of certain planets; 1. Saturn in 8th house. 2. Mars in the 5th Bhava and Ketu in lagna. 3. Saturn in lagna & Sun, Moon, and Mars in the 7th. 4. Malefics in the ascendant and Moon in conjunction with evil planets. . 5. Malefics like Rahu, Ketu, Kuja in 6th, 8th & 12th houses. 6. If strong malefics occupy Kendras 4th, 7th, & 10th bhavas. 7. Rahu and Moon occupy 7th & 8th houses and Jupiter is in the lagna. 8. If the lord of 8th bhava is in the ascendant and the lagnathipathi is weak. Madhyayu Combination or configuration of planets to give madhyayu : 1. If the lord of 3rd or 6th bhava is in a Kendra sthan. 2. Mercury, Jupiter, & Venus in 2nd, 3rd &11th houses. 3. Lords of 1,8,10,11 are powerful. 4. Birth lord in 6th or 8th house with malefics. 5. If Saturn dasa is at birth time and Moon is in 8th or 12th bhava and other planets in 11. 6. For Scorpio lagna, Jupiter in lagna, Mars and Rahu are placed in 11th house. 7. Mars & Mercury are in quadrants, Venus is in ascendant & exalted planets in the 3rd and 11th houses. 8. Mars in 5th, Sun in 7th and Saturn is debilitated. 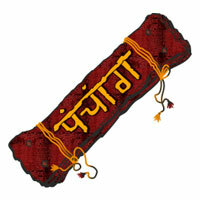 Purnayu The planetary combinations for purnayu are as below : 1. Lagna is aspected by the lagna lord. 2. 8th house aspected by the 8th lord 3. Jupiter in Kendra sthanas. 4. If Jupiter is in a quadrant from the lord of the birth with no malefics in the quadrants. 5. Jupiter in lagna, Venus in 4th & Saturn & Moon in 10th. 6. Jupiter in lagna, Venus in 4th, Mercury in 5th & Sun in 6th give long life i.e., purnayu. 7. Benefic planets in quadrants & trines, malefics in 3, 6,10, & 11 bhavas, life is upto 98 years. 8. If all planets are in quadrants, the person lives 100 years. 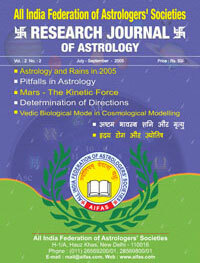 It is further to state that in Indian astrology the longevity is not beyond human control. The lives of anti-social elements are lost by mix of violence, hate, anger, jealousy, greed and by arrogance etc., On the other hand there are countless examples where a life of spirituality, piety, peace and piousness has given a span of ninety years and more. In Jataka parijata the philosophy of longevity is explored in some of following Slokas : “Ye dharma kharma nirata dwijatevabhakta ‘. ye padhya bhojanarata vijitendriyascha. ye manavaa dadhati satkula seelamaa steshamldam kadhita mayu rudardhibhihi’ This Ayus has been declared by wise men in respect of those who are engaged In the practice of virtuous actions, who are devoted to the pious and to God, who eat wholesome food, who keep their senses under control and who preserve the noble traditions of character and conduct of their families. “Ye papa lubdhachowraa ye deva brahmana nimdakaha bavha sinascha ye teshamakaala maranam nrunaam” V -36. Premature death overtakes those who are sinful, covetous, thievish, who revile God and the virtuous and who are addicted to gluttony. Apamrutyu hetuvs “Dhanne vikalpa budhinam dhuseelanam cha vidwishaam brahmananam cha devanaam para dravyapa hannaam” -V.37 "Bhayam karaanaam sarveshaam Murkhanaam pisunasya cha swa dharmachara hinanam papa karmopajeevinaam.” V- 38. "Sastreshwa niyutaanaam cha mudhanamapa mrutyuvaha anyeshaa muthamayuhu swadithi sastra vido vidhilhu.” V- 39. Sudden death seizes those who are sceptical of the force of moral law, who are vicious and hateful of God and the pious, who steal others’ goods, who are a source of dread to all, who are foolish and indulge in calumny, who have abandoned their duties and observances, who live by sinful sources, and those who would not wholly abide by the tenets of the sacred scriptures. Those who excel ( in astrology) regard the rules of Ayus as applying only to people other than those declared as liable to untimely death. Astrologers should make a careful study of the horoscope, first of all the category of longevity should be fixed and then by study of maraka dasas should predict with 100% caution.